Jordan Ingram interviewed Oregon Football’s Jeff Lockie for FishDuck.com at the University of Oregon’s Hatfield-Dowlin Complex. As Oregon fans and the rest of the country continue to watch Marcus Mariota breeze through the draft process, the reality of him not coming back is finally here. On Wednesday, the Ducks began their second spring practice without Mariota, but a familiar face was there taking snaps and calling plays. The same face that had a court-side seat the last three years to watch the best quarterback in Oregon history play football. 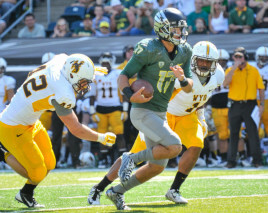 Jeff Lockie looks to capitalize from Mariota’s teachings. The name of this fortunate man is Jeff Lockie. For the last three seasons, he got to watch who he considers his “best friend” go from a scrawny little kid from Hawaii to become arguably the most talented player in the entire upcoming NFL Draft. 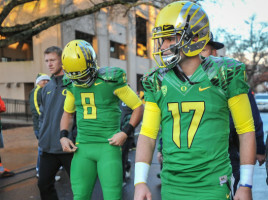 But that’s all a thing of the past now, as Lockie begins to embark on his new journey to becoming the Ducks starting QB. 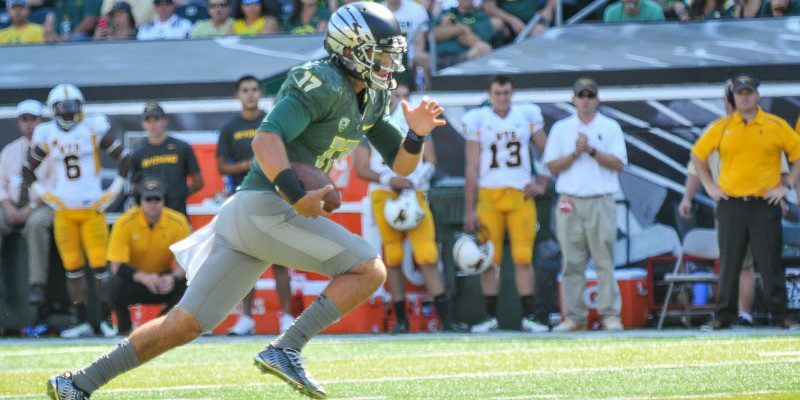 Spring practices will bring out the best in all four quarterbacks on the roster, with each of them wanting to be the next great Ducks’ quarterback, but it is Lockie’s job to lose. He has been in the program for three years now and, when compared to all the other quaterbacks, Lockie is light-years ahead of them all when it comes to knowing the offense and the playbook. When asked about having to take command of the locker room and weight room this season, Lockie’s response was “It’s a big responsibility of mine to take that weight upon my shoulders, I’ve been here for three years, and I think I’m ready for that.” He also goes on to say that the younger QBs have been looking to him for guidance as they start their collegiate careers. Jeff Lockie breaks a tackle to get into open space. Lockie was also asked about the search for a new center is going with the loss of Hroniss Grasu to the NFL. He responded with “Good,” then later stated that everyone from Jake Pisarcik to Matt Pierson have been getting some reps in – even the impressive freshmen, Zack Okun, who is 6’5 and 325 pounds from Newbury Park, California. With the new pieces being put in place this Spring on the offensive side of the ball, Lockie’s experience could put him atop the depth chart heading into fall camp.